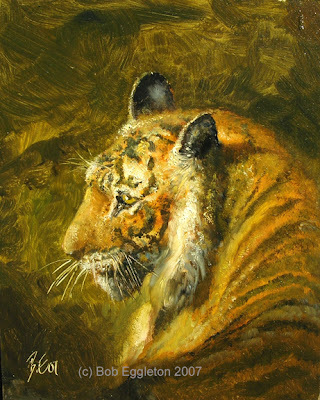 Tiger (8x10, oils on panel, SOLD!) Here's a couple of new paintings of the day. The top one is based on some pics I took on the West Coast, near Monterrey, with this wonderful golden light right about sunset. I worked my own embelishments into it, and just was really pleased with the result. The bottom piece was based on some images of a tiger I found, I just love painting tigers. Getting their stripes is very hard to do, and do right because the edges, up close, between the oranges and the stripes, are kind of diffuse. I love big cats of all kinds. I want to paint more, for sure!! I also painted both on panels, which I don't usually work on but in this case, it was just right. The paint sort of just moved around easier than on a rough canvas and this created it's own nice effects(like the background of the tiger). Anyway, remember it's Christmas-shopping season for those people who want one-of-a-kind presents! 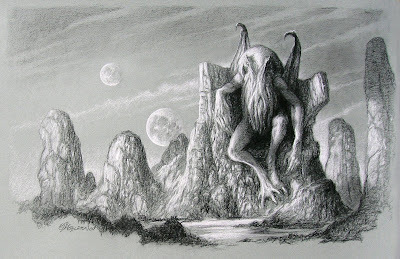 Just a drawing, done on toned paper of HPL's darkest creation, Cthulhu...sitting on his throne in some netherworld...it's for sale, so email on the price if interested.... also, click on the image and you can see it in alot of detail!!! Normally I don't get into these things, nor do I post links. But this deserves a rant. What we have here is political correctness attaining new heights of stupidity. This illustrator was told to change the art she had in a kid's picture book because the idea of fire breathing dragons "could be dangerous to health and safety". It appears that such suggestions are prevailent in the UK and the US. Okay, give me a break. Who sits around and dreams up these idiotic assumptions?Further an example of dumbing down of everything. I don't know what it's coming to but this one really takes it. Years ago, I bought a model of a Utahraptor and some months later, I had a Federal Fish and Game "official" call me and ask me if I had indeed purchased it, and what I may have bought was illegal under endangered animals acts. I reminded him that a Utahraptor was an EXTINCT dinosaur. Long silence. Finally...."Oh. Sorry". People really make me wonder. Eye Pod Attack!!! So here's a new cover I did for this Ben Bova collection of funny SF stories. I was totally stuck for an idea that would be fun to paint. So I went with the idea of this creepy monster going to eat a spaceship...Eye Pod Attack!!!! I did this in oils, it's 16x20 and, it's for sale but inquire on the price! 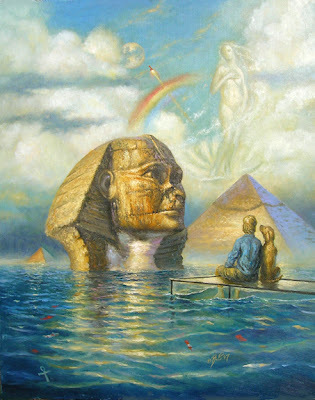 I was really inspired more than a bit by my friend Eric Joyner's marvelous works. 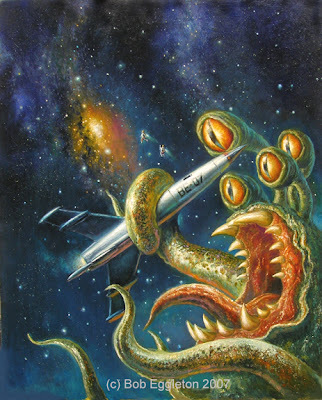 Sometimes I think Science Fiction is taken WWAAY too seriously, so time for some fun with giant slimey monsters! My sig btw is on the rocket itself!Compare with the sketches in the previous posts. A new larger(18x24) painting(NOT a painting of the day) for a re-issue of an old Heinlein book called BETWEEN PLANETS from 1953. 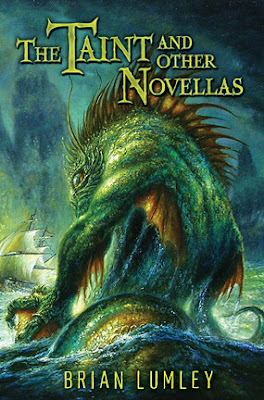 Fun book, takes places on a romanticized Venus and this is a human with a Venusian dragon as they are called-weird alien things with multiple limbs and even more eyes. Fun stuff to do, compare with the sketch from a few posts ago...been a real grind of a week so far. But I press on, so enjoy! Laugh Lines(8x10, oils $150) These are color sketches, work ups for paintings that will appear later. The top one is for a Heinlein re-issue of a very old book BETWEEN PLANETS. Takes place on a very strange Venus. 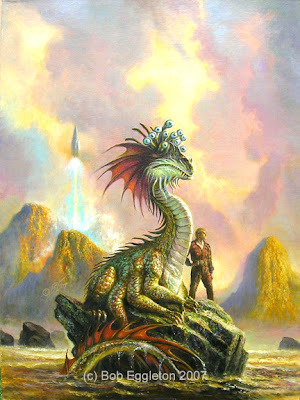 Lots of cool visual stuff including these Venusian dragons. I wanted to avoid any dark colors or my usual habit of throwing green & orange into everything(Is it my fault they WORK as colors?). The bottom painting is for a collection of Ben Bova stories. Not very visual but, one is a pastiche on how SF shows and movies are made and, Bova's obvious contempt for such based on his own experience consulting(The Starlost-anyone remember? ), so I went for the cliched giant space monster and space ship. Lots of fun and the final will be a hoot to do! Back from The World Fantasy Con in Saratoga, NY. Lots of fun and, friends I haven't seen in ages. Really a good time!! I'll post some piccies soon! 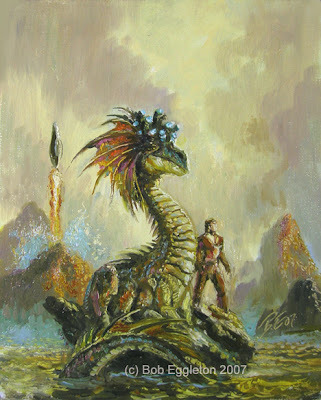 I seem to enjoy fantasy and, darker work-horror, moreso than I enjoy space related work. 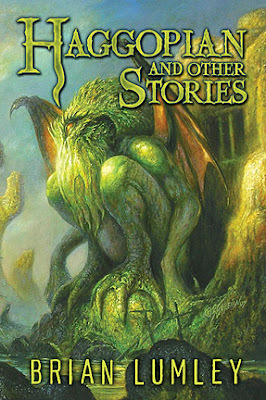 Note my fixation with Lovecraftian work. 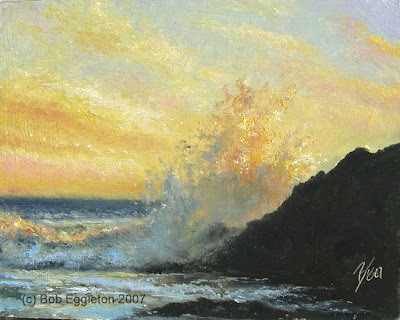 I was once a "Fellow" of the International Association of Astro Artists. I dropped my membership and "Fellowship" in it awhile ago and, realized I haven't missed anything. I never understood what a "Fellowship" was anyway. 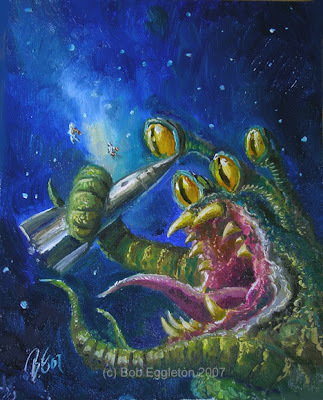 One of my "FAQ's" is "Why did you stop painting space art?". Largely, because the computer has truly replaced the human hand w/brush in this regard. Computer/digital art truly is amazing, and, frankly, Hubble telescope pix and Cassini and all, have just put most "space art" to shame. That said, space is still a nice backdrop to use for sci-fi imagery...and I'll still do that anyway. Speaking of, a couple of nice work-ups for some covers soon!